So, where does he go from here? Monster wins on the Derby trail are nice, but you want to see his Fountain of Youth effort on the first Saturday in May. Hate the six weeks from the Fla. Derby, but it may actually help him, especially if he runs another corker. Eyebrows were raised after his un-Baffert-like 1:15 2/5 work, but Baffert said it was just what he was looking for and that the work was really 7 furlongs in 1:27 4/5. The champ silenced the doubters with a 7-furlong follow-up work in a bullet 1:25 1/5. Baffert has mentioned the Rebel as a possible next start. That would be quite a dirt initiation. Big move up this week. As mentioned in our last column, his five-eighths of a mile sustained run gets more impressive the more you watch it. Don’t know if 10 furlongs is ideal, but there is enough stamina to go along with his talent, running style, and physical prowess to suggest he will. He’ll get a stiff test in the Rebel, and if he runs big again, the sky’s the limit. The more you look at him the more you realize he’s as accomplished as any of them and has less to prove than most of them. Remember, he has won on dirt and has the perfect running style. There’s really nothing not to like. Pletcher decided to give him the extra week and run in the Rebel instead of the March 6 Gotham; tough spot first time back. He certainly doesn’t have to win, but needs to take back off the pace and show he can close. Wintering at the farm is a bit unusual, so he also has to prove he’s the same horse as last year. If he answers both questions, he’ll move back into the top 2 or 3. Still feel he has as much potential as any of them. Honestly don’t know where to put him, and won’t until he runs back. They practically handed him the Risen Star and he took advantage of it like a good horse will do. He needs to show he’s as effective from off the pace, but he’s rated before. These top four Pletcher horses can drive you batty trying to figure out a Kentucky Derby-winning scenario for them. We keep harping on their running style, and despite their talent, they could wind up their own worst enemy. He has tremendous potential, but still needs to prove himself against better quality horses. Worked five furlongs in a sharp :59 3/5. Sadler has to decide whether he wants to run him and Sidney’s Candy in the March 13 San Felipe against Caracortado or go out of town with one of them. Can’t wait to see what he can do on dirt. That’s the only thing keeping him out of the top five. 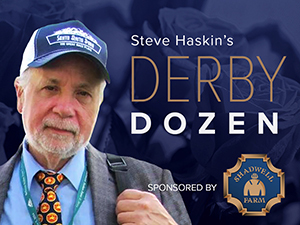 He had a lot of people climb on his bandwagon after that Tampa Bay Downs allowance romp, and we’ll find out March 13 if it was justified in the Tampa Bay Derby. He appears to have it all, and now it’s just a matter of passing his class test. He’ll skip the Rebel and go right to the Arkansas Derby or Wood Memorial, which looks like a good move. He’s already won two graded stakes around two turns, both at a mile, and you don’t want to give him too many 9f races. He’ll have only two starts before the Derby, but built up a solid foundation as a 2-year-old. Rebel will be a tough task first time back and first time on dirt, but we’ll at least get an idea whether he’s a serious Derby horse. Feel as if we didn’t seen anything near his best in the Lewis, and Leparoux left a lot in the tank. Big decision is whether to run him in the San Felipe and Santa Anita Derby or only once before the Derby, trying him on dirt in the March 28 Sunland Derby. Like Dave in Dixie, would love to see him on dirt.